Add a contemporary elegance to your home decor with this chic white TV stand. With ample surface area that accommodates all TV sizes with a center stand, this tv console will add style and functionality to your living space. Featuring 2 large storage drawers for DVDs, CDs, remotes, or gaming accessories, 3 open concept shelves perfect for placing electronic components, complete with an opening in the back to keep your wires out of site and organized in style. Sleek silver colored drawer handles and a smooth finish makes this contemporary tv console a must have in any home. Full assembly instructions are included. 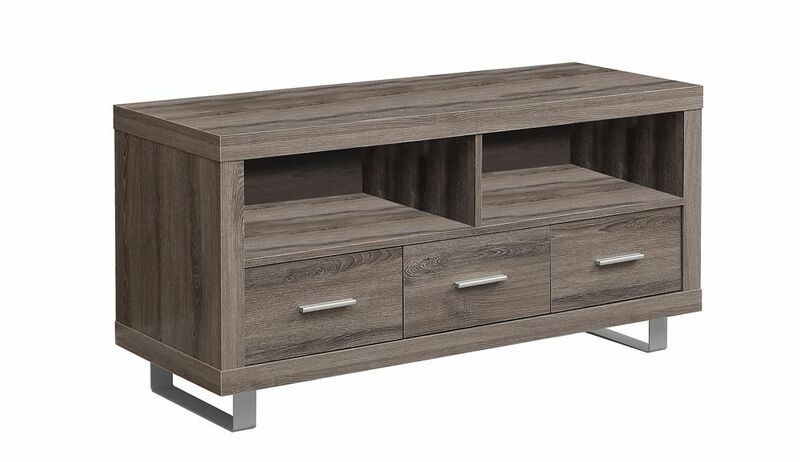 Tv Stand - 48 inch L / Dark Taupe With 3 Drawers This contemporary TV console finished in a dark taupe wood-look features thick panels, modern silver metal legs and accented with elegant silver drawer handles. The sleek profile of this tv stand will perfectly compliment all the newest flat screen TV's and components. The tv stand features three spacious storage drawers, two open storage shelves and two pre-drilled capped holes in the back for convenient wire management. This stylish console fits perfectly in a living room, den, basement, or office space. Tv Stand - 48 inch L / Dark Taupe With 3 Drawers is rated 2.0 out of 5 by 1. Rated 2 out of 5 by Eric from Table can easily fall over. legs need to be wider to give it a bigger footprint My wife and I were happy to find a reasonably priced console table for our 50" TV. It took about 1.5-2hrs to put the table together. After installing the legs I determined that the table could very easily tip over unless it is properly strapped to a wall stud. We have the table on carpet, so that could be part of the problem. I could remove the legs to make it more stable, but we like the look. Now I'll be finding a stud and installing the straps.